Dart raised the camshaft and spread the oil pan rails to provide extra clearance for stroker cranks. 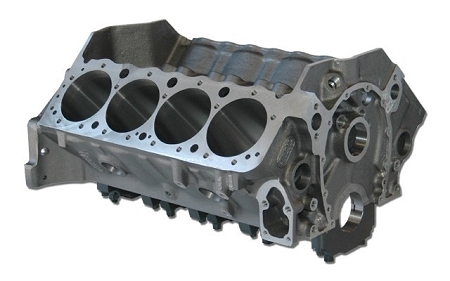 The versatile Iron Eagle block is the perfect starting point for a big inch small block project - you can build a 455ci small block with Dart! standard 9.025" and tall deck 9.325" versions allow for greater versatility. Raised camshaft .391" (4.912" camshaft to crankshaft centerlines) provides more clearance for stroker cranks and eliminates need for fragile small base circle cams. Option for .434 raised cam also available. Relocated oil pan rails are spread .400" per side (.800" wider than stock) to increase crank/rod clearance and reduce windage losses. Siamesed cylinders: Standard 4.000" or 4.125" cylinder can be safely bored to 4.185". Extra thick walls prevent cracking and produce excellent ring seal. Oil pan bolt holes are relocated in line with main caps to eliminate interference with rotating assembly. Main bearing bores are available for 350 (2.45") and 400 (2.65") bearings allow engine builders to maximize crankshaft strength and minimize friction. 4 bolt billet steel main caps have splayed outer bolts minimize bearing bore distortion. Big block camshaft bearings allow use of cams with larger base circle diameter to improve strength and recue twisting with cam driven pumps. Dual starter mounts allow starter to be mounted on either side of block for chassis and oil pan clearance. Front and rear external oil inlets, crossover and restrictor provisions to simplify plumbing with external pump. Honing the cylinders on our Sunnen CV616 with torque plates. Check all lifter bores and hone if necessary. Check line hone, adjust if necessary. We ship all of our engine blocks through Unishippers, We will only ship to commercial locations with loading docks and or forklift trucks. If this is not an option we can also set the freight for customer pick up at the shippers terminal. Call 305-893-5018 for an accurate shipping price.